Nolawi's post on "Fua Fua yilal Dodgu" reminded me that I had slacked off on the blog and need to get back to business! For those unaware, "Dodgu" was first performed back in the early 60's if not earlier–I still have to find the original artist. Netsanet Melesse re-recorded it in the mid 1980's with the Second Walias Band.The post also reminded me of a song that was recorded in the summer of 1971. Imagine yourself in a cramped up recording studio in the middle of Addis with the legendary Haile Selassie I Theatre Orchestra. On this particular day, two songs were recorded by Philips Ethiopia. Side A was 'Aderech Arada' by Menelik Wossenachew and Side B was 'Qelemewa' by Telela Kebede. Both songs were written by the great Getachew Debalqe, actor and lyricist at the HIM I Theatre. Both songs were arranged by Getachew Degefu (1944-2002). Though known for his amazing skills on the keys, Getachew Degefu however was first recruited to the theatre as a vocalist. In both songs you can hear Getachew Degefu's organ solo. 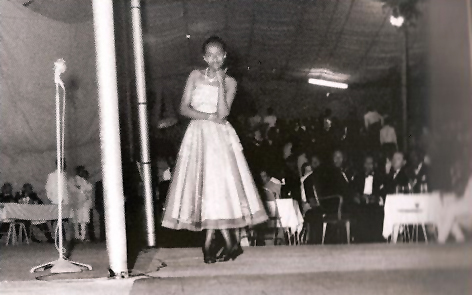 Telela Kebede was also known as an actress and vocalist. Her famous song was 'Lomi Tera Tera' also written by Getachew Debalqe. It was written and recorded and performed in the eve of the 1974 Revolution. Though it criticized the Emperor and his policies, it was after the Dergue took over that both Telela and Getachew were imprisoned for the song. Getachew Debalqe was imprisoned for eight long years for penning 'Lomi Tera Tera'. If you listen carefully to 'Qelemewa', you will here 'Dodge' played in a different key (qignit). Podcasted is Telela Kebede's 'Qelemewa' and though this is not about Menelik Wossenachew, I'm also including 'Aderech Arada' to the podcast so you may feel what took place. Published by Ethio Jazz April 3rd, 2007	in Music and Series. I love both songs. Nice style Telela!! you were nice & cruel at the same time. tortured me with A lash of memories. I dont know about y’all but the old songs & musicians were simply at a higher level. Their songs just don’t die out with time. Time appears to refine them over. Either it is us the Sidetegnochu who refuse to detach ourselves from this torturing memories or simply they were amazingly creative and original. The Radios constantly blasting Aderech Arada reminds me the EnquTatash season, when the spring Adey flowers across the meadows would make Addis so beautifully SHIQERQER with that fresh smell of September. Telela looks in deed classy on the picture. One thing is for sure, the way our folks (women both young + old) dress, no matter how conservative, had class & grace! I wonder what consumed that feel of pride and originality. Good work, man. Hats off to you. I don’t know of any other person who is good at keeping track of not just the songs but also the history, the pictures, the poeple etc… that go with it. You are a hero, bro, may be unsung, but definitely one. … Thanks again Ej…what can I say..your musical genious is invaluable…If I had it my way I would’ve opted for as many such posts as it is humanely possible..nonetheless..thank you brother..
p.s. Do you have any of Bahta G/Hiwots songs?..I have the digitally remastered one but would love to listen to the older version…thanks again..
p.p.s may be Merhawi can help me with this..? Jazziye! You’re just my favourite! I haven’t heard Aderech Arada in years…I love this song..thanks! Following in Soj’s footsteps…do you have any of the Yerga Dubale songs? thanks ej! love the songs, and the “behind the music” info is just fascinating. ej, i’m very impressed that you spotted the theme and variation between Dodge and Qelemewa. you’re right, it’s the same melody on different scales. i can hear Fua Fua is on the pentatonic scale, but Qelemewa is on a more jazzy scale that i’m unable to name. or is it just on one of the more traditional (ambasel, bati, anchihoye, tizita) scales? musicians or music geeks, please enlighten us! my name is tewodros. I am not an artist but i just felt imprerative to express my deepest feeling to our national heritage, Telela. I know that Telela is one of the contemproary artist who pionner in the modern Ethiopian Music History. I always think that we are lucky to have this wonderful artist among us and share her exploits. EJ this is so great. Your depth of knowledge is incredible. I truly enjoy listening to your rich selections and learning about the making and the message behind the song. I am not a fan of the direction our music is headed these days. In any case, is Lomi Tera Tera available for listening ? After reading the blog you linked i really want hear it. Thanks, EJ, The post was worth the wait. Great work EJ, as always!! I love the selection, and thanxx for the background info as well. always amazes me how knowledgable u’re in the history of Ethiopian music, especially when there aint many accessible written matterials availabe. Thank you all for the wonderful comments, and head exploding accolades. The experience I’m having at Bernos has truly humbled me and I have you all to thank. Temelakach–esti i’ll dig in the crates to find Yirga Dubale for you. Until then, if you haven’t seen this enjoy this. Yonas–pretty sure both are in the pentantonic scale…will try and find out which is which. FN/NF–unfortunately don’t have Lomi Tera Tera yet–will share it the moment I get it. …Ej man, ur amazing…muchos gracias…I say his voice is still wonderful, after so many years. The music was also tight. Jazz, you rule! …I’m in awe! I loved both tracks; I’m also reminded to raid the parents shekla collection the next time I’m in Addis now that I fully appreciate Yediro zefen. I know you’re busy and all but I’m still waiting for another entry to your “Bandochu…” series. You promised a write up about Ibex Band in Part III. Thank you so much for the tizita. Man, what a treat! Thank you! I always look forward to your postings. i cant wait to get my hands on Absyssinie Swing. thanks for getting me smart to it EJ. gin, not to sound like an ingrate but why hasn’t Falceto featured Telela on any of the series?? please tell me im having a memory lapse. this is the first i ever heard of Getachew Debalqe. is there a source where i can read/hear/see more of his work? is he even featured in ethiopiques? I know for sure that Mulatu Astatqe has a version of it too, but before he did his, a female singer recorded the first version which i suspect is Telela. if any of you guys have this song? please PLEASE do share the wealth. Selom-glad you liked it. Let us know what you bring back from Addis. The ‘Bandochu’ series is on hiatus for a little while–I hope to have the story completed by the middle of the summer. Thanks for your patience. shtoni-Telela, I think has only 2 songs on shekla and we will probably see her in a future release. As for Getachew Debalqe–I’m not sure apart from these two songs podcasted if any of his works were ever release on shekla. By the way both Getachew and Telela were know as actors first and their writing and vocalist skills respectively came in later. Francis Falceto by the way dedicated Abyssinie Swing to “Gash Getachew Debalqe” very endearing don’t you think? I’m sure we will hear about Getachew Debalqe in the future. As for the song you mentioned, not sure if Telela did it. As you mentioned Mulatu did it with Seyfu Yohannes on vocals. Esti, I’ll ask around. note from Telela, thanks EJ! apparently my family members are friends with her..
Hi, a little message straight from the swiss alps, to tell you that I love ethio jazz and would like to thank you for sharing. It is the time of the year – InquTaTash and The Millennium. I have been watching Telela Kebede on http://ouretn.com/video_.html. Then I came to this website and found her song. As a bonus, I also listend to Aderech Arada. Simply fantastic! Thank you. Kelmewa by Telela higily polised&class. I admire the author for documenting the works of these great actors. I remebmber Lomi-tera-tera was sang by a young boy dressed like shepherd on the eve of inqutatash in Biherawi Theater (Haileselasie Ist Theater). Does anybody remeber his name? I admire the author for documenting the works of these great actors. I remebmber Lomi-tera-tera was first sang by a young boy dressed like shepherd on the eve of inqutatash in Biherawi Theater (Haileselasie Ist Theater). Does anybody remeber his name? Very pity that he had so little information. this require a great deal of work? I have virtually no expertise in computer programming however I was hoping to start my own blog soon. blog posts on ƴоur website, I гeally appreciate yur technique of blogging. ɑոd աill Ƅe checking back ѕoon. It is a single around the accuracy shaving technology it includes. This was precisely what happened in Ayutthaya after its 1569 nadir. read posts, however this weblog presents feature based writing. If some one wants to be updated with hottest technologies after that he must be go to see this web page and be up to date everyday. on any surface providing the solution you need in no time at all. the best five card hand, from the combination of hole cards and community cards on offer. finest, having no connection with poker. Proteam is the first companies worldwide to produce a hybrid backpack unit that has all three of these traits. Vacuuming regularly can drastically reduce allergy triggers in the home which will lower the dependence on medications. I can’t think of a good analogy, anyway it may not be very strong. the pressure, straightens the hair. I am truly glad to glance at this blog posts which contains plenty of helpful facts, thanks for providing these statistics. Wonderful forum you have here. Good stuff here to enjoy. Looking forward to seeing more. Only hope to have more minutes to stay longer. Fantastic site you have here. Great stuff here to enjoy. Looking forward to reading more. Only hope to have more minutes to stay longer. I blog quite often and I genuinely appreciate your information. This article has really peaked my interest. I will take a note of your site and keep checking for new information about once a week. I subscribed to your Feed too. 0 toe electronic looks much more friendly and intuitive than the current operating system. jogging then Seconds Pro is your go-to iPhone app. We have been a group of volunteers plus launching a fresh design within our area. Your website presented united states using very helpful information and facts to be effective with Video Poker Game ,. You’ve done an outstanding task in addition to your total team are going to be thankful back. will lead to loss of popularity and reader interest. I genuinely enjoү reɑԀіng ߋn this ѕіte, іt ɦaaѕ ɡօt fantastіc агtіclеѕ. it has an external microphone jack. 6 of the regular major scale. You will realize that it’s a significant scale without degees 5 and 7.
good over tthe major blednd progression.